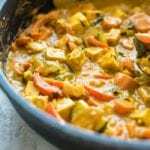 This creamy vegan curry is easy to make in about 20 minutes. All you’ll need to make it is basic pantry ingredients plus some tofu and vegetables. It’s thick, creamy, full of flavour and amazing served over a bed of basmati rice ready to soak up all the goodness. Add the diced onion, garlic and carrot to a skillet and cook over medium heat in coconut oil, water or vegetable broth until they’re starting to soften, 5-10 minutes. Add a splash more broth if it starts to stick. Add the zucchini and red pepper and stir to combine, adding a bit more broth as needed. Add the tomato paste, curry powder, turmeric and salt and cook for a few more minutes, stirring to combine. Add the vegetable broth and coconut milk and simmer lightly until the carrots are tender and it’s thick and creamy, about 20 minutes. Stir occasionally as it cooks. Stir in the maple syrup, peanut butter, cilantro and cubed tofu and cook for a few more minutes until the peanut butter is combined and the tofu is heated through. Serve over basmati, brown rice or quinoa. Adapted from the Chloe Flavor cookbook.